In the midst of the centenary of the Great War it is surprising to find that there are few current theatrical efforts on the subject underway; the National Theatre's War Horse gallops apace, of course, and now The Wipers Times is also on hand to address the imbalance in its UK tour. 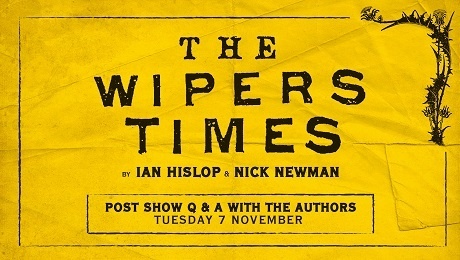 Adapted by Ian Hislop and Nick Newman from their television film, the play tells the story of the creation of the journal named "The Wipers Times" (from the Tommies' inability to correctly pronounce "Ypres"), a precursor to modern satirical magazines that forwent the route of detailing sombre events and endeavoured to raise the spirits of troops in the front lines with jokes, limericks and the like, often parodying the mainstream media of the time. Translating the story from its historical routes via television and onto the stage, Hislop and Newman have skillfully crafted a funny, witty and truly moving play that utilises material from the original newspaper that they turn into theatrical pieces that pepper the true-life story of the newspapers' creators, Captain Roberts and Lieutenant Pearson. Simultaneously, Hislop and Newman raise these two men and their soldier-appreciated product from the bottom drawer of history. Forming a backdrop to the frivolity, the Great War's progression poignantly comes to the fore at various points throughout the play and the tragedy of war becomes all the more striking when contrasted with the humour that soldiers themselves created as relief. For the most part, the jokes feel fresh and modern rather than a hundred years old and they further reinforce connections between the past and present (none more so than in the jokes that revolve around the Daily Mail). Hislop and Newman's script captures the bravery, camaraderie and humour in the face of adversity that evidently saturated the soldiers' lives and director Caroline Leslie's production manages to balance the sober with the ridiculous, with a hint of the amateur nature of the newspaper's production in the skits realised in mock music-hall style. This is furthered by the creative unit set of Dora Schweitzer and the atmospheric lighting of James Smith. The sound design of Steve Mayo also breeds an appropriately disturbing soundscape and the musical settings by Nick Green, incorporating actual poetic content from the journal, furthers authenticity. The cast are nothing short of superb and they are equally hilarious and tragic as apt and they form an authentic company ably led by James Dutton and George Kemp as Roberts and Pearson, respectively. They deftly portray the underlying fear masked with humour adroitly and their performances become all the more tremendous for it. 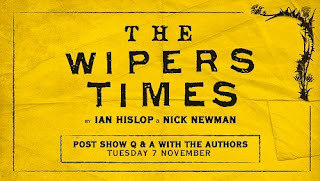 A powerfully moving yet heartily humorous play, The Wipers Times is strong stuff and serves also as an informative document of a forgotten piece of Great War history. Employing contemporaneous material composed by serving soldiers adds a depth to the humanity of such people not often seen in material written after the fact and this extra dimension creates a fresh take on a grim period of history. Buy a ticket - history is rarely as concurrently moving and entertaining!